In thinking about how I managed to rid myself of depression, I’ve realized the importance of getting ready to recover. This idea never occurred to me during many failed attempts to find a way out of the underworld of living. I had hoped there would be a quick, linear pathway to feeling fully alive again, but there was never going to be such a simple solution. I mentioned in a post on patterns of recovery that I really could have used the sort of roadmap that writers on PTSD have developed. Having a sense of what lies ahead and what to expect would have been great, but even more basic would have been an understanding of the inner skills I would need to keep going. In saying that, I don’t want to suggest that it’s possible to approach recovery in a linear way. You can’t say to yourself: Well, I’m depressed, and I want to recover. So I need to learn these skills first, then create a master plan covering all the bases and then get started. That doesn’t happen – except in books about the latest sure-fire way to cure yourself of depression. I can illustrate what I mean about learning skills by backing up to that first idea: I’m depressed. 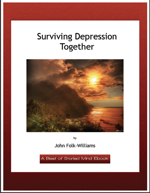 The ability to recognize that I had a condition called depression was my first breakthrough. As obvious as it seems, it takes a lot of mental muscle power to get to this basic awareness. Until I could do that, I was simply lost in a kind of whirlwind. I had no idea that I was experiencing anything but my own nature. This was my life, a swirling mass of moods and drives and ideas about myself that were indistinct. My behavior was driven by those forces and influences, and I made sense of it all by believing I was a bad or stupid or worthless person. I needed the ability to stand back from those drives and begin to separate one from another. I started to do that when I sought help from psychiatrists at the height of two crises that occurred during my twenties. Those crises passed as soon as I could identify something like a cause – an association with family history or a habit of thinking that was distorting my experience. Those moments of insight and the self-exploration that led to them were like basic training. They helped me develop the ability to look at my experience more as an observer than a driven victim. Becoming an observer of dominating feelings and thoughts is what meditation teaches as well. That is a powerful way of building the skill, but it’s not the only way of achieving some level of emotional detachment. Every form of therapy helps you learn how to step back from experience and emotions that feel overwhelming. For me, writing about what I was going through also helped. That’s another way of learning how to sort things out and name the many different influences that add to inner pain and confusion. But awareness only goes so far. It was one thing to wish to feel better. It was much harder to want recovery so deeply that I could take action to get started and then keep going. What prevented me from doing anything for a long time was fear. Fear had stopped me from pursuing therapy after those early crises, even though I knew it was helping. In each case, I got to a key insight, felt better and then got out of there. The skill of being able to experience the fear as an observer helped me get past it – but only after so many times when the fear was strong enough to dominate my behavior. For me, it was fear of change, fear of launching into daily life without having the certainty, however grim, that depression provided. As I’ve written elsewhere, it set the habits I used to get through everyday life, though, of course, they were terribly self-defeating. I could readily imagine feeling good again, feeling “like myself” but that self had been conditioned to live with depression since childhood. Fantasizing about a great life ahead was one thing, but changing what I did from day to day evoked a deep resistance. The truth was that I had only lived without depression for isolated periods. It was the life I knew best. So making a consistent, determined effort to stay with any form of therapy became hard. There would always come a point where I’d slow down, back off, or give up out of a sense of failure. Those were the moments when fear took over, though I’d convince myself there was another reason – the treatment didn’t work, the therapist wasn’t any good, I didn’t have time to do it right. I could always come up with some excuse other than plain old fear. The ability to explore this fear as an observer – not avoiding it but letting myself feel it – finally helped me to set it aside. But this also happened only after a lot of failed attempts and a lot of fear. It never feels good to do – or avoid doing – anything out of fear. I felt great when I got to the point of believing: I can do this, and I’m going to get it done. What has been the biggest obstacle for you to start and then stay with your attempts to recover from depression? I want to get better, I know I’m depressed but beyond medication have no idea what to do next. I’m 51, and following a severe knee injury almost six years ago have chronic pain. After nine surgeries we now know the doctors can’t fix it, so I have to come to terms with the fact that I’m going to need pain medication potentially for the rest of my life. What now?, marriage is badly damaged and need help just don’t know what. I’m currently on long overdue visit to see my family on the other side of the world, which has been helpful although hasn’t helped me work out what to do when I get back home. The hardest thing is living day to day not really caring much about anything, where do I start when it feels like we have nothing in common anymore? How did you got your feelings back? That’s a long story that I’ve written about in many posts throughout this blog. It’s one thing to have the feelings, another to let yourself express them. I’ve struggled with both. A post I did a long time ago, called the Gift of Belief, describes one turning point – but also points out that it was something of a mystery to me as to what finally made the difference. I keep working on this. My biggest obstacles are not allowing myself to just be, denial and suppressing my feelings. That’s all very familiar to me. I have a continual anxiety about having to keep doing things, even when they take me away from my family. Suppressing feelings – I have considerable expertise in that one. All I know is nothing in this life is ever perfect, not for anyone. We all have something to suffer. Some things have to be accepted so we can get on with it. We can become addicted to depression, the solitude it produces becomes a trusted companion. Becoming an observer, putting plenty of space around the negative stuff provides the distance necessary to fully see reality (just like in an art gallery). I also know it imperative we forget and forgive the past, otherwise it keeps us bound. From Pema Chodron: “Sometimes we meet someone who seems to have a great sense of well-being, and we wonder how that person got that way. We would like to be that way. That well-being is often a result of having been brave enough to be fully alive and awake to every moment of life, including all the lack of cheer, all the dark times, all the times when the clouds cover the sun.” Our suffering depression forces the development of a deeper grip of reality. Having been there, we are stronger, have a depth to us. I very much agree with you and with Pema Chodron about the power of being alive in the moment and getting enough distance to see the fullness of reality. You put it quite beautifully in the analogy of the art gallery. I get a little nervous, though, about comparing severe depression to an addiction or something you use as a refuge. It’s true that depression can instill habits of mind and feeling that are hard to break. But unlike an addiction (which depends on actively doing things to experience a peak moment, an intense pleasure), major or clinical depression of the recurrent variety doesn’t depend on your something to take hold – or on the triggers of particular life events. It becomes self-sustaining. You must make a decision and commitment to get better, but the reason it’s so hard to recover is that depression keeps coming back despite your best efforts to get free of the past, to meditate and live in the present, to retrain your thinking to stop the endless negativity, to change diet, exercise – do all sorts of things to bring back the vitality and awareness of a full life. I apologize if I’m preaching to the choir here, but some of the words we use are misinterpreted to mean that severe depression is a choice, and that’s terribly unfair, especially in light of all the research that brings out the neurobiological dimensions and physical impacts of the illness. – It’s a pet peeve, and I have my lecture ready for the world in general! I’ve been delighted, by the way, to get acquainted with your website. There are so many powerful and apt quotations there – it’s a great way to share these ideas.